Ah, the good old days. Bratislava’s Starý Most, or “old bridge” – seen in the foreground in the feature image back in the days when it still existed – personified them for me insofar as the city centre stretch of the Danube went. Did. It’s quite a shock, when you’re going for a stroll around a city you know well, to suddenly see something you assumed was a permanent fixture in the skyline utterly demolished. So it was when, the other week, I saw Starý Most, (one of only three bridges spanning the river in central Bratislava, along with Most SNP to the west, and the newest city bridge on Košická seen in the feature image background here to the east) gone for good and replaced by an imposter – the all-new, less-romantic, pedestrian/cyclist/tram connection to Bratislava’s high-rise suburb south of the river, Petržalka. Which opened in its entirety, trams and all, in August 2016. Petržalka, with the largest population of any Bratislava neighbourhood, has long had a tram connection in the pipeline. The problem, however, was that plans hinged on totally reconstructing Starý Most. In its pre-demolition state the old bridge rocked even when you cycled across it and the first tram that tried going over would have been swept on downriver to Budapest. Now, as of August 2016, that reconstruction has been completed: and tram service over it courtesy of the No 1 Tram route from the main train station of Hlavná Stanica and the No 3 Tram Route from Rača goes through Šafárikovo Námestie as far as Jungmanova in Petržalka. The other stops it calls at on the Petržalka side of the Danube are, in order, Sad Janka Kráľa and Farského. But I have to say I’ll always remain sad about the old bridge going. It had, after all, been around since the 1890s. Emperor Franz-Joseph personally oversaw the opening, for Godsakes (although the actual steel part of the bridge was rebuilt after 1945). Since it was closed to traffic, and the greenery grew up around its pedestrian crossing, it provided a peaceful and (for the romantics) uplifting crossing from the Old Town to the Danube hiking/cycling trails out to Čunovo on the other side. In short it had personality. And personality is something reasonably lacking in more recent Bratislava riverside development. The plan is anticipated to take away a lot of the congestion and tram traffic around Šafárikovo Námestie too. Bratislava, it seems, will have one significantly extended tram route – and all within the next month, according to the latest estimate. A multi-million Euro grant from the EU paid for the destruction/ reconstruction of the bridge by the way. Whilst the plan will no doubt far more interest Petržalka’s 100,000+ residents, it’s also a heads-up for visitors to the city. Why? 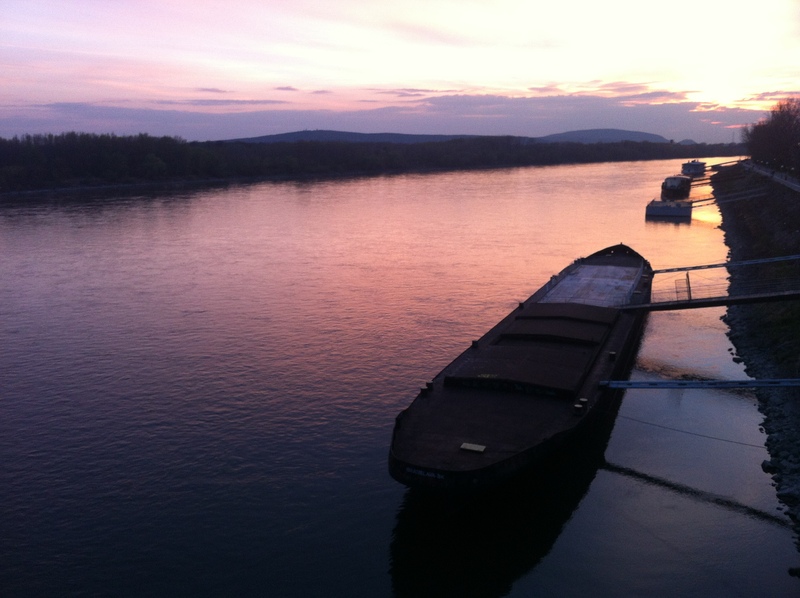 It could well usher in a new spell of development on the southern shore of Bratislava’s Danube. Let’s remember that one of the key factors in a city’s success/failure lies in its connectivity. There’s a direct correlation between problematic or poor districts of a city and how isolated those districts are. Connectivity=progress; progress=prosperity; prosperity is something that wouldn’t go amiss in Petržalka and the south-of-the-river area. At the moment, the Most SNP bridge crowned by its UFO restaurant is the only real access to the south side of the river for pedestrians or cyclists. When finished, Starý Most will make strolling or pedalling over to the south shore much more conducive. And the south shore is currently very under-developed (unusual in a city as thirsty for development as Bratislava normally is). This is partly a great thing, of course – you can lose yourself in woodlands almost immediately on the other side. But the beauty is counter-balanced by a lot of derelict buildings and construction sites. Room for improvement: yep. And coaxing that improvement along? Well, a large number of classy places already exist on the south side – a really good theatre and a few good restaurants (more on these in other posts). Anyway, for now it’s RIP Starý Most. See Petržalka in relation to the Old Town on a map.